One of the ways the Department of National Defence and the Canadian Armed Forces are commemorating the service of Canadian personnel is through an Afghanistan Memorial Vigil. The Vigil commemorates those who lost their lives during the Canadian mission in Afghanistan: 158 CAF personnel, a Canadian diplomat, a DND contractor, a Canadian journalist who was embedded with the CAF and more than 40 United States Armed Forces members who were under Canadian command during operations in Afghanistan. The plaques were formerly part of the Kandahar Air Field cenotaph. 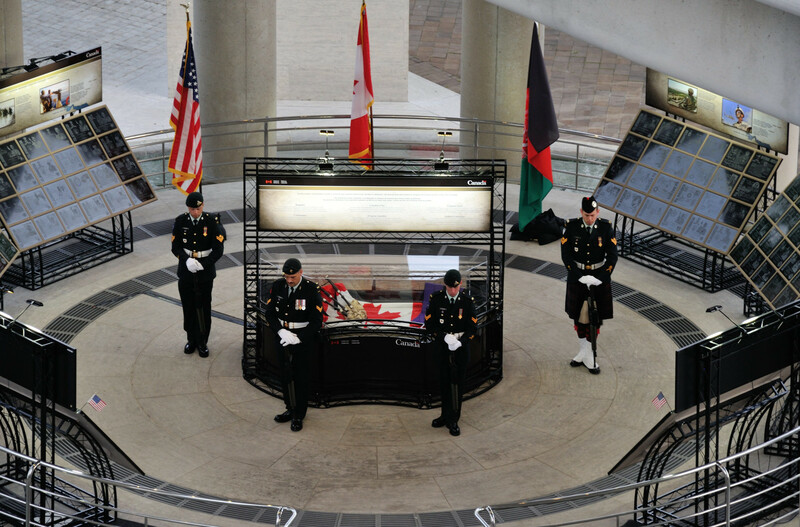 The cenotaph was a memorial structure for Canadian soldiers to commemorate their fallen comrades while deployed in Afghanistan. The rest of the cenotaph is housed in a warehouse in Ottawa awaiting decision for a permanent home. The Afghanistan Memorial Vigil remembers and honours those who have fallen in Afghanistan. It also acknowledges the bravery, dedication, valour and professionalism of all members of the Canadian Armed Forces who have served in Afghanistan and supported the mission. The Vigil will travel to the College militaire royal de St-Jean and be on display from March 10th to March 14th 2015. It will be open to public viewing starting on March 11th from noon to 8 pm and on Saturday March 14th from 8 am to 4 pm.